Subscription boxes have been growing in popularity over the last year, with both consumers and small or home business owners, for a while now. The end of 2015 saw a rapid increase in overall interest: Individuals starting, buying and talking about subscription commerce as a new and exciting way of doing business. 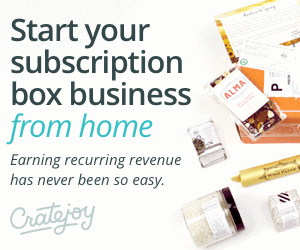 So what makes running a subscription box business a good idea for you? Think of it this way: One of the reasons subscription boxes are so popular is that it feels like a little surprise gift — from yourself to yourself — every month. You know you’ll like the stuff since you signed up for the subscription, but you also get the experience of opening it up every month. Thanks to the internet and modern technology, you don’t have to need a billion-dollar idea to make money as a subscription box merchant. You just have to know what you like. For example, my stepmother has been a career nurse and hospital administrator for nearly thirty years. To instantly make her into a subscriber, I would design a box to serve her value not just as a nurse, but as a sophisticated and appreciated individual: Something the world tends to forget. I would pack it with comfort necessities like gel insoles and pain relief samples, and humorous stickers or magnets, but then I’d balance that crate out with more urbane treats like exotic tea bags, reading supplies like bookmarks or gadgets, and travel-related knickknacks. Nurses would love what it says about them, and those of us who love the nurses in our lives would love to show appreciation for the whole person. That shows we recognize them as very special, unique people. Identifying an underserved community, or reaching them in a new way or a way that plays against stereotypes or assumptions, has given many of the most successful subscription boxes, like Fandom of the Month and BattleBox, all their popularity. Fandom of the Month is for women who are geeks, and love the jewelry and treats from their favorite geeky brands. The Butter Box caters specifically to bath-and-body enthusiasts who love food flavors like sugar, vanilla, and chocolate. Cruelty-Free For You & Me delivers a high-value mix of vegan, natural pet and beauty products. In all these cases, the market seems obvious after the fact, because all it took was one smart merchant to prove the point. 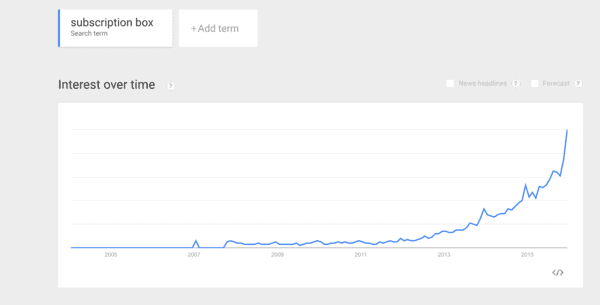 By getting the word out early, you can get people onboard before you’ve laid out a single cent. When you’ve had your great idea and can’t wait to get started, waiting for subscribers can be the toughest part. But if you do the work of finding them and getting them all stirred up ahead of time, you can cut down on that stress and use that time rather than just waiting for orders to roll in. 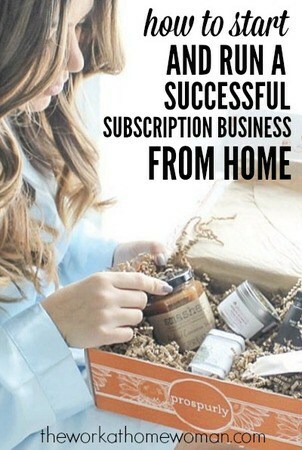 Subscription commerce is one of the lowest-risk home businesses we can start since you have time to grow an audience and still make a profit from the start. That means the more effort you put in before officially launching, the better off you’ll be in the long run. Plus, it gives you a better estimate of your needs before you even start looking for products to stock your crates with, which can help when you have to put your “buyer” hat on and start making deals with suppliers. SUBSCRIPTION MERCHANT: THE PERFECT FIT? There is a bit more to subscription commerce than with some other side or home jobs — although not as much as you might think, thanks to companies like Cratejoy, where I work, and free apps and sites online that can help ease the way. We make it easy for you to create a storefront, manage customer accounts and transactions, and even enable you to purchase and print postage from within our platform. This last year, we've gone a step further and started helping merchants find subscribers through our new marketplace. If in that first month you only have to source products for 100 subscribers, you can put your profit into infrastructure, design and other one-time costs. Then, as the business grows, you can improve on churn, get better bulk pricing for products, and so on. The recurring aspect of it makes it the perfect choice for home business – as it grows, the business becomes easier, more profitable, and less time-consuming. While the initial outlay and time management are negligible for starting a subscription business, the rapid growth that’s possible can come with its own challenges: Finding a place to store your stock once the orders outgrow your workspace is the most common complaint. But any of us would count ourselves lucky if the problem with our side job became too much demand, and frankly, there are tons of fulfillment companies that accommodate subscription services. Work on finding Your First 25 Subscribers and locking them down. This post was sponsored and written by Cratejoy. Please be aware that we can only promote advertising from companies that we feel we can legitimately recommend to our readers. So from what I’m reading, you as the merchant directly fulfill the customer’s order. That is obtain and purchase the items and directly ship it to the customer. Cratejoy supplies the platform to support the e-commerce aspect. Is that correct! Yes, that is correct! Cratejoy hosts your website, analytics, customer management, recurring billing, the Marketplace, etc. The merchant sources products, does fulfillment, and customer service. However, we have great resources and partnerships to help you find and ship your boxes easily! If you have any questions, please don’t hesitate to send me an email at eliza@cratejoy.com. What are the legalities with products in the box. Can I put anything I choose or am I going to businesses and asking them to include their products in the box? I would like to know the answer to your question too. Does crate joy help find boxes to send goodies in? Does CrateJoy offer ideas for subscription services? Thanks Holly, I’ll check it out. I sell Ladies hats and accessories. Not sure how that would equate into a subscription business. I believe there are some free tutorials that you can check out. You may be able to combine your accessories with other like items. Example: Use each month’s birthstone color and create a box with that color of accessories for the month: Hat, nail polish, lip stick, etc. Good luck and keep us posted! Feel free to send me an email if you have any questions to eliza@cratejoy.com. I can put you in touch with a team member to help get you started! HollyHanna: I have to check out CrateJoy. Do they cover an international service area? I want to start with tea subscription service in the future. Yes, Cratejoy is open to international residents.